The research paper is a complex assignment regardless of the topic you have to elaborate. When your professor assigns the topic, it's easier for you to complete the project because you have a starting point. When you have the flexibility of choosing your own topic, you get stuck before you even start. First of all, you need to see the positive side of your professor's decision: you can write on any topic you like. You get the broad guidelines, so you only need to conduct a preliminary research that would help you determine your preferences. The research paper topic has to be a bit more complex when compared to the title of an essay. Don't settle for simple constructions that wouldn't give enough space for solid arguments. This is a relatively long project, so you should choose a topic that will help you think of enough arguments that support the main thesis statement. It would be best to start thinking about the topic of your research paper as soon as possible. The classic technique of brainstorming is really effective at this point. First, you need to look for some online sources related to the broad subject you're supposed to cover. Once you do that, start noting your ideas. What was the most inspiring aspect of the matter? Did you criticize some of the opinions you read? Which author made the most authoritative arguments? Write everything down and you'll eventually be able to construct a topic out of that list. The topic has to be defined as a focused research question. If you haven't written many research papers before, you'll have troubles finding the right form. Don't worry; EssayMama is always here to help! 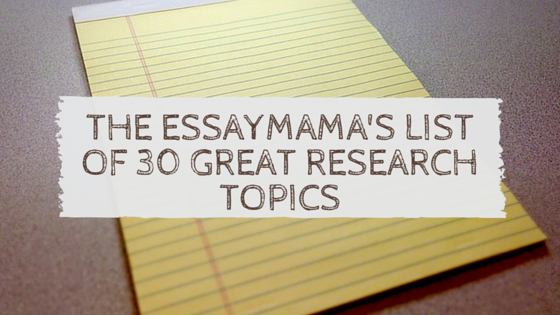 In the continuation, you'll find 30 suggestions for research paper topics from various areas of study. Use them as your inspiration and be open-minded about alternations. How does tobacco affect the human mind and body? How does religion affect the abortion issue? How does political activity improve one's chances for employment? Why do women get confidence after applying makeup? Does the Internet make people smarter? Which are the most effective methods of fighting anxiety? Does prolonged exposure to the sun damage the skin? How did social networks change the way people communicate?